DISCLOSURE: I received an advance reading copy of this book from NetGalley and Algonquin Books in exchange for an honest review. About twenty years ago, big-box bookstores started popping up all over. Barnes & Noble and Borders were as ubiquitous (and as large) as Whole Foods or Target. They were places to meet up for blind dates (Starbucks in a wide-open, brightly lit public place? Yep, that will work. ), to read magazines for hours on end (without purchasing them, of course), to browse cookbooks and travel books, and to buy all of your hardcover bestsellers for 20% off the list price. These days, even the big-box bookstores aren’t safe. E-books and online retailers are taking over the market, and bookstores, large and small, are, tragically, shutting their doors. Sad. A.J. spends his days at the bookstore (which, not surprisingly, is not very successful) and his nights eating frozen dinners and drinking until he passes out in his small apartment above the shop. You’re probably picturing a grumpy old man. He’s a crouching, white-haired guy in his seventies, perhaps? But, no, A.J. Fikry is only thirty-nine at the start of the book. A year and a half ago, his beloved (and pregnant) wife died in a car crash, and, understandably, he has been in a funk ever since. But, lucky for A.J. (and for us! ), he is about to encounter a quirky cast of characters (like Amelia, the “dirty-blond giantess” book rep from Knightley Press), hell-bent on bringing him back to the land of the living! This book is pure fluff (cute writing, funny, light, and sweet) in the vein of Where’d You Go, Bernadette. It’s not particularly deep, it’s very predictable, and it’s a little too simple (and, yes, the ending is schmaltzy, rushed, and trite. But this is fluff. What do you expect?). Nevertheless, it gets a 4/5, because it’s highly enjoyable, super fast-paced, well-written, and a perfect summer book. Re: their date. For a time, the novelty of the circus had distracted from the fact that they had nothing in common. By the end of dinner, the greater truth of their incompatibility had been revealed. Perhaps it should have been obvious from their inability to reach consensus on an appetizer or from his main course admission that he disliked “old things”—antiques, houses, dogs, people. Still, Amelia had not allowed herself to be certain until dessert, when she’d asked him about the book that had had the greatest influence on his life, and he’d replied Principles of Accounting, Part II. I read it for the first time at Princeton in a seminar called the Literature of the American West and was not moved in the least. In my response paper (dated November 14, 1992), the only thing I found to recommend it were the colorful character names: Stumpy, Kentuck, French Pete, Cherokee Sal, etc. I chanced upon ‘The Luck of Roaring Camp” again a couple of years ago and I cried so much you’ll find that my Dover Thrift Edition is waterlogged. Methinks I have grown soft in my middle age. But me-also-thinks my latter-day reaction speaks to the necessity of encountering stories precisely at the right time in our lives. . . . [T]he things we respond to at twenty are not necessarily the same things we will respond to at forty and vice versa. This is true in books and also in life. Preach, A.J., preach!! This blurb reminded me of a discussion I had with my brother about The Great Gatsby. He recommended I re-read it in my thirties and said he could not understand why that book is taught to high schoolers. Too true. Who should read it: It’s almost summer, and this is a perfect beach or plane-ride book. If you’re heading on vacation, this would be a good book to pick up. It would also be good for those of you who like light, easy reading for their metro rides to work (Shana, I’m looking at you). 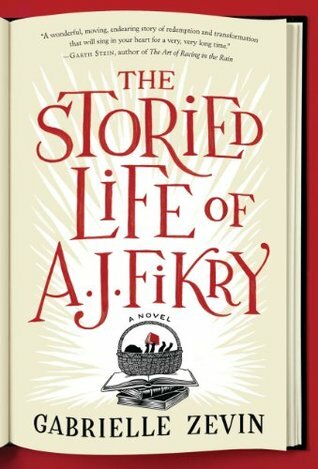 This entry was posted in Rating: 4/5 and tagged Book review, Book Reviews, Books, Gabrielle Zevin, NetGalley, The Storied Life of A.J. Fikry. Bookmark the permalink. I like that clip with You’ve Got Mail; I didn’t even think of that comparison, but it’s great. I enjoyed this book, but really it’s hard not to like. Thanks for your review. I’ll be looking forward to your Frog Music review. Thank you; I’m glad you enjoyed the review! As an aside, I just read your glowing review of All the Light We Cannot See. I have heard GREAT things about that book and am looking forward to reading it (it’s next in line after Frog Music!). I hope you enjoy it as much as I did. So many great books–it’s awesome! Great review! I was a little disappointed with this book, probably because I went in with overly high expectations. It’s fluff and, as such, it’s good. If you aren’t hoping for more, Fikry provides a fun read. Plus, it’s fluff for book lovers with some great references and so that elevates it a little bit! But for someone looking for fun, light summer reading, this is an excellent choice. This was so fun and quirky. AJ, Amelia, and Maya are very likeable (and the one unlikeable character meets a premature end – jerkface). Next book: Maya’s point of view in college as she encounters books in her studies and embarks on her writing career. This would be a perfect beach read (especially on Cape Cod). Oh, hurrah! I’m glad you enjoyed it! !